Explore, hike, golf, enjoy fantastic sights, taste mouth-watering food, board, whale watch, kayak or swim in the cool Atlantic waters and rappelling—these are all on the list of possibilities for the adventurous traveler in Southern New Brunswick, Canada. Alma is a small fishing village nestled along the coast next door to Canada’s beautiful Fundy National Park. While the tide is out, you can walk the ocean floor while passing two tall tide poles that the local people have planted in the hard ocean ground. Later, witness the highest tides in the world roll in over the sea bed and appreciate how high 53 feet of water really is. When your stomach starts rumbling like the waves, let the tantalizing aromas of Kelly’s Bake Shop draw you in. Purchase fresh bread or some warm, cinnamon sticky buns which are a favorite to both the year-round residents and the tourists. Before leaving, have someone take your picture while you sit on the huge whale skull located on the shore next to the Alma Lobster Shop. 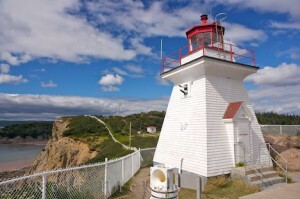 Travel a few kilometers east of Alma along the Fundy Coastal Route and stop to climb the cliff to see a 150-year-old lighthouse. Experience the thrill of rappelling, savour a bowl of seafood chowder at the on-site restaurant, or picnic while watching the rolling whitecaps. Afterward, check out some of the local talent at the Studio/Gallery. 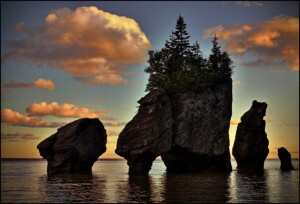 The Flower Pot Rock formations, nestled on the Bay of Fundy shore line, are one of the great wonders of this picture-perfect province. Gaze out over the waters of the Bay of Fundy and drink in the fresh, salty air before descending the iron staircase to explore the giant sand- surrounded rocks topped with greenery. Later, let the incoming tide—its whitecaps breaking before your feet—push you back up the stairwell. You may then wish to visit the canteen or the restaurant while you wait six hours for the ocean floor to become visible again! Explore New Brunswick’s first national park, which was created in 1948. The park covers 206 square kilometers in the Acadian forest, and there are 110 kilometers of hiking trails ranging from easy to difficult. Be sure to hike along the Dickson Falls Trail, which descends down the mountain and takes you past a flowing stream surrounded by moss and ferns and to some amazing waterfalls. 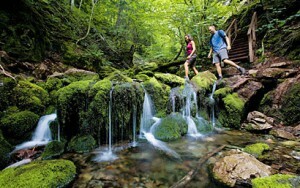 The Fundy National Park is home to hundreds of plant species and numerous sea and shore birds. Golf lovers can try their swing at a challenging nine-hole course. In the afternoon, enjoy a swim in the salt water heated pool. Later, after settling into one of the park’s three camping grounds, climb into a kayak or canoe and explore Bennett Lake. With the full moon lighting your way, let an interpreter guide you to the beaver dam. Listen to a description of the bats that fly overhead during the darkness of the night. Turn your flashlight beam into the brush along the shore to reflect the shinning eyes of many small animals. Stop anywhere in New Brunswick for great hospitality and history. Every village, town, and city has its own uniqueness to explore and savor.